We would like to expand the ranges of rides and activities that we offer to promote cycling to a greater number of Lambeth residents. At present we have two projects in mind and are looking for volunteers. Lambeth Cyclists are hoping to work with local disability organisations to get more people on bikes. We are already planning on leading a ride with Lambeth Mind and we're interested in getting a project going for people with learning difficulties or physical or visual impairments. We've got pretty good links with local disability organisations but it would be good to get some more people to help plan/ fundraise/ attend events. Lambeth Cyclists are also looking for people who would be interested in leading family friendly rides. So if you know of any good short distance (maximum distance around 10miles) routes around South London or easily reached by train get in touch. Over the summer Lambeth Cyclists have continued to work with Transport for London on Cycle Route Implementation and Stakeholder Plans (CRISPs) across the borough – most recently on the route along the A3 from Clapham Common to Elephant and Castle. CRISPs allow TfL’s consultants to gain first hand knowledge of what conditions are like on the ground by cycling along the route with those of us who use it on a regular basis. The results of the CRISP are used to assess the effectiveness of existing cycling facilities and to inform proposals for how the route could be improved. As you might imagine the A3 CRISP highlighted improvements that could be made to the Stockwell one way system, the area outside Oval tube station and problems that cyclists can have accessing Elephant and Castle. The CRISP programme will continue in the autumn by looking at the TfL red routes in the South of the borough (generally the larger roads such as the A23, A3, A205 etc) over the next few months. So if you use a Red Route as part of your regular cycle journey and would like to contribute to this process let us know. Details of the CRISP arrangements will be circulated on the email group or contact Philip Loy. 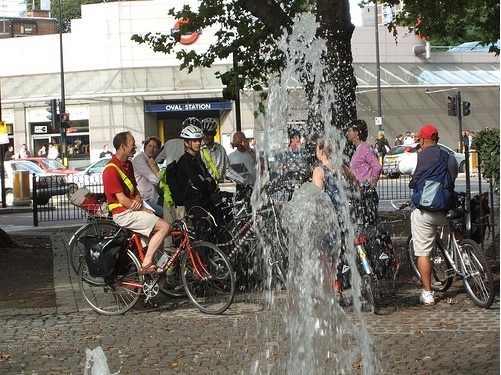 In August 23 of us, led by Chris James had a very interesting day looking at the water facilities of London. We visited MDF drinking fountains and cattle troughs (not the MDF we know, but the Metropolitan Drinking Foundation), learnt about the massive sewage pipe which has resulted in the Victoria Embankment and were reminded again about the great engineering feats of the Victorians in bringing water down from Hertfordshire without pumps. Thanks to Chris for the time and effort he spent putting together such an enjoyable and rewarding ride. Research carried out by TfL with Lambeth Cyclists found that the amount of motor traffic was one of the main reasons why people dont cycle. One way to reduce car journeys is to limit parking at a journeys end via a Controlled Parking Zone. In my neighbourhood, the Ruskin Park area, we are getting together to campaign for a yes vote because research shows that although not many of us own cars we live in a highly polluted area. Local children want to walk and cycle to school but carers and parents prevent them as cars parked on corners make it difficult to cross roads. The area is a key walking and cycling desire line, criss crossed by local cycle routes, reducing motor traffic will encourage people who walk and cycle. Lambeth Borough Council have won the prestigious Sustainable Transport Borough of the Year award from Transport for London. TfL commended Lambeth on its work to promote sustainable transport and in particular its initiatives to promote alternatives to cars such as the ‘Love your legs’ campaign. Over the past year the number of school travel plans has increased in the borough from three to 27. The borough itself has taken a positive lead as an employer and compiled a travel plan for staff that impressed TfL. Other initiatives such as the promotion of car clubs, cycle training and days such as the Bike for Fun day in Kennington Park were held up as examples of good practice in promoting sustainable transport. Cabinet member for Environment and Culture Lib Peck, who attended our sustainable transport question time prior to the May elections, congratulated all the staff on this award which is as a result of their work over the past five plus years. We would like to think that Lambeth Cyclists has played a small role in the borough getting this award by our campaigning and gentle persuasion to promote sustainable transport. Further information on Love Your Legs and links to information of workplace and school travel plans is available at www.lambeth.gov.uk/loveyourlegs. A mixture of old and new favourites made up Lambeth Cyclists' Bike Week this year. Our first ride was a pleasant and sunny river ride to Richmond Park along the Thames path. Other rides during the week explored the many interesting corners of the borough and the surrounding area. Our breakfast ride provided a good start to the working day and our ride to the barbecue in Vauxhall led to a very pleasant evening of eating and drinking. The Dulwich Dynamo ride on the Friday night saw us eating and drinking again starting at Olley’s Fish and Chips in Herne Hill. Our final ride of the week traced the varied scenery along the banks of the Thames between Dartford and Lambeth. Look out for Bike Week 2007 which will be held 16-24 June! As usual on the weekend of 15-16 July 2006 we will be staffing a stall at the Lambeth Country Show described as ‘South London’s premier summer event’ and attended by over 100,000 people. This is a great day out and a good opportunity to raise the profile of cycling. We need volunteers to spread our message – so if you could spare an hour or two please contact Philip. Further information will be available nearer the time on the email list or at our meeting. If you’re at the Country Show do come and say hello and pick up the latest TfL and Lambeth cycling maps. If you work in the City you may be interested in the following events being organised for Bike Week 2006. The first ever celebration of Bike Week (17-25 June 2006) in the City offers a great range of events from a cycle show organised by the police in the Guildhall Yard, the launch of subsidised cycle training to architectural bike tours. It couldn't have come at a better time with official figures showing that bicycles now make up 10% of the City's vehicular traffic. Join in the excitement as cycling achieves critical mass in the centre of Europe's biggest city. SPECIAL NOTICE: if you are cycling through the City this Saturday and see a flock of sheep don't worry, you're not dreaming. It's part of a moving installation as they are due to be herded from the Tate to Smithfields Market for a street fair. should be one of the biggest bike week events in central London. subsidised cycle training and other information. Implementation Plan for 2006-11 just uploaded. You may also be interested in events in our neighbouring boroughs – see www.bikeweek.org.uk for more information. 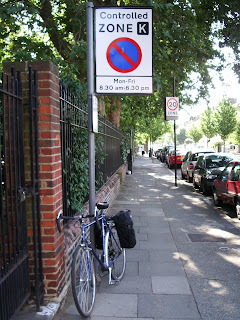 Monday 19 June 2006 – Cycling the boundary - a circular ride around the borough boundary discovering the hidden gems of Lambeth. This will in part follow LCN route 5 and act as an informal cycle route inspection. Meet 6:30pm Stone Circle outside National Theatre, South Bank, SE1. Lambeth Borough Council have told us that a new version of the Lambeth Borough Cycle Route Map will be launched during Bike Week. Watch out for further information! Our April meeting (highlighted previously on the site) saw representatives of the main parties standing for election to Lambeth Borough Council debate the issues around sustainable transport in the borough. We were joined by candidates Stuart Barr (Conservative Party), Duncan Law (Green Party), Lib Peck (Labour Party) and Andrew Sawdon (Liberal Democrats). The meeting was very ably chaired by John Stuart, long-standing friend of Lambeth Cyclists and transport activist. All the candidates largely agreed on the necessity of encouraging more cycling in the borough and pledged to work to reduce the number of pot holes and improve cycle facilities. On questions such as expanding the number of 20mph zones, extending the congestion charge zone and working with Transport for London opinion was more divided. In particular Labour’s Lib Peck challenged the decisions the council had made or had failed to make on the Brixton central square scheme, Vauxhall and Brixton gyratories and their lack of leadership on transport issues. As you are probably aware the election on 4 May 2006 resulted in Labour gaining 10 seats and control of Lambeth Borough Council: the balance of power now is Labour 39 seats (+10), Liberal Democrats 17 seats (-10), Conservatives 6 seats (-1) and Greens 1 seat. We in Lambeth Cyclists look forward to working with the new Council Executive on all cycling issues over the next four years. The AGM meeting also saw the election of a new Management Committee for Lambeth Cyclists. In a tense election Philip Loy was re-elected as Borough Co-ordinator, Olivia Christopherson as Treasurer, Clare Neely as Council Liaison Officer, Luke Evans as newsletter editor and Janet Paske as Projects Officer. Lambeth Cyclists have recently been awarded several thousand pounds worth of grant money for cycle promotion projects in the Stockwell area. We are working with project partners SEA Renue, a specialist consultancy working on sustainable projects throughout London (they have also worked Southwark Cyclists on similar projects). There will be a series of various cycle promotion schemes in the area for local people, including maintenance classes, Dr Bikes, and taster sessions to boost employment in bike-related services, e.g. the training of mechanics. Cycle Training (UK) Ltd are also involved in the project. If you live in Stockwell, look out for the local events! Lambeth Cyclists have been contacted by the Herne Hill Ward Safer Neighbourhood team at Brixton police station about the spate of bike thefts occurring at the station. The Police would like to raise awareness of security issues with commuters who leave their bikes at the station. We are liaising with the Police and will be participating in a joint exercise to publicise the initiative one evening. We also be issuing the LCC's booklets on bike security and other information. Do you live near the station? Could you help out for half an hour giving out these leaflets? The date is to be decided but it will be one evening during the week shortly. Watch out for information on the email group or contact Philip Loy. On Thursday 4 May there are elections to Lambeth Borough Council. In preparation for these we will holding a local election question time on Tuesday 18 April to find out the views of the parties standing in Lambeth on cycling and sustainable transport issues in the borough. In particular we will be asking about cycle facilities and training, measures to promote safer cycling and the place cycling and other means of sustainable transport will have in their plans for the Borough Council. We have invited all the parties and hope to have a good evening of debate. The meeting will be held at the Bread and Roses pub, Clapham Manor Street, SW4 on Tuesday 18 April starting at 8:30pm. The Lambeth Borough Council elections this year are being hotly contested – the Labour Party are hoping to make gains and get control of the council while the ruling Liberal Democrat–Conservative coalition are defending their position. Currently Labour has 29 seats on the Council, the Liberal Democrats 27 and the Conservatives seven so a gain of three or four seats by Labour or the Liberal Democrats could see the council change hands. In past elections low turnouts have been recorded for local elections across the borough so a few hundred people could determine the future political control of the Borough Council. It is vital that we question our candidates on cycling and sustainable transport issues and all use our votes. To check that you are registered and to find out details of your local polling station contact Lambeth Electoral Services on 020 7926 1000. At our election question time meeting on 18 April we will also be holding our Annual General Meeting. At this we will elect a new Lambeth Cyclists Management Committee. The posts of Borough Coordinator (Chair), Treasurer and four or five other Management Committee posts covering areas such as communications, rides, council liaison and campaigning are up for election. If you would like to get involved in running Lambeth Cyclists put yourself at the AGM. The commitment isn’t huge –usually we have one informal committee meeting a month in addition to the regular Lambeth Cyclists meetings. To find out more about the Management Committee contact Borough Coordinator Philip Loy. February’s architecture ride concentrated on London’s museums and galleries taking a look at the great buildings that grew up to house the nation’s treasures. We visited a mixture of the well known –the museums of South Kensington for example- and the more obscure before ending up for tea at the Imperial War Museum in Kennington. March’s ride is set to visit architecture from the 1960s and 1970s. Entitled masterpieces or monstrosities? it was set to take in the National Theatre and South Bank complex, the Royal College of Physicians and other significant building of the period. Coming up in April and May we have two further rides in the series – looking at the works of Voysey on Saturday 22 April and focussing on the architecture of the Medway area on Saturday 20 May. Charles Voysey was an ‘Arts and Crafts movement’ architect who spanned the late 19th and early 20th centuries. His architecture is noted for its long, low-roofed houses with coarsely plastered exteriors. The architecture rides generally start early morning and last for most of the day. 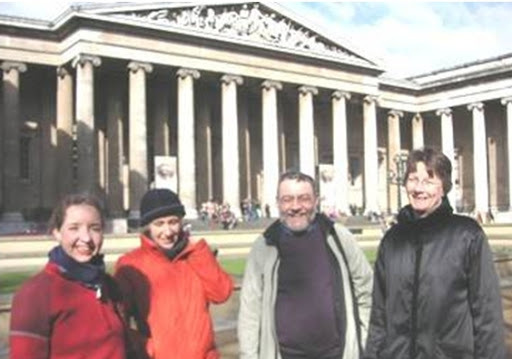 They offer a leisurely ride around the architect’s work with stops for refreshments and led by an enthusiastic guide. Further information on the rides will be available on the Lambeth Cyclists website and email group nearer the time or contact Janet Paske, tel 07740 457 528, email Lambeth_cyclists@hotmail.com. 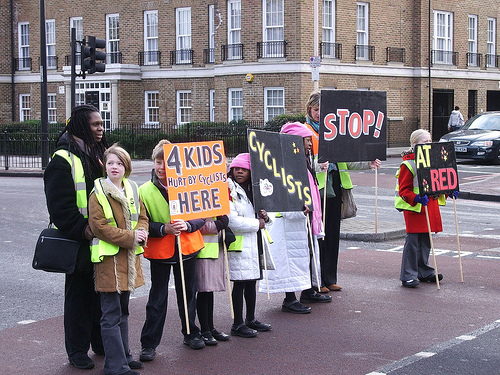 At the end of February Lambeth Cyclists supported parents and pupils of Reay Primary School in Stockwell to campaign against cyclists failing to stop at red lights. We joined with children from the school, local Police, Borough Councillors and MP Kate Hoey to highlight the issue which endangers school children and other pedestrians crossing the road. The story was covered extensively by the South London Press, BBC News website, the Evening Standard, the Independent and the Guardian and we were quoted adding our support to the school’s protest and emphasising the importance of cycle training for everyone as a means of instilling the importance of complying with road traffic laws and minimising the risk to other more vulnerable road users. We hope to have a continuing dialogue with the Police about this issue and others such as advanced stop line enforcement which have an impact on cyclists in the borough. We have been contacted by concerned parents of children at Reay Primary School on Hackford Road, SW9 and asked for our help in stressing the importance of the need to always stop at red lights. The consequences for us as cyclists of not stopping at red lights are far reaching. In the autumn term of 2005 four children at the school were hit by cyclists as they crossed Clapham Road at the traffic lights at the junction with Caldwell Road. Having carried out a cycle count on the junction at the start of the school day (between 8:40 and 8:55 every morning) the parents found that 60% of cyclists did not stop at the red lights. As a result of the collisions and disregard of the traffic law by cyclists parents are justifiably angry and have called on the Police to enforce this junction and hand out fines to cyclists crossing the red light. Parents at the school will be campaigning on this issue in the week beginning 27 February 2006 and we will be offering our full support in this campaign against law breaking by cyclists. It is in all of our interests as cyclists from a public relations point of view that we comply with traffic law and always stop at junctions. 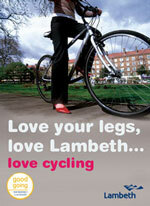 Look out for further information about the campaign on our website or on the Lambeth Cyclists email group.